On Monday, April 8, 2019, four RMS students in Mr. Ayres Engineering Club competed in the Garver Chain Reaction Challenge competition at the State Capitol in Little Rock, AR. Mr. Ayres chose the top students from his engineering club to participate in the competition. Logan Magil, Magnus Golden, Luke Watson, and Tyler Mitts were chosen to participate in the Statewide competition. 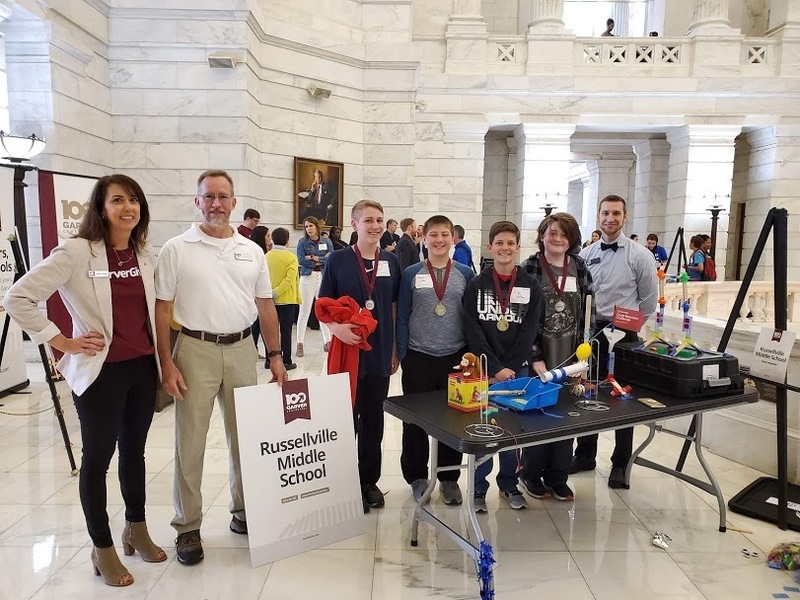 Russellville Middle School was chosen along with seven other central Arkansas Middle Schools participate in the challenge at the Arkansas State Capitol. The Garver Chain Reaction Challenge is an initiative designed to “inspire young learners to pursue future careers in engineering.” During the challenge, students will learn STEM concepts and the engineering design processing developing critical thinking skills. Students were tasked with building “Rube Goldberg-style” devices during the challenge. Garver distributed STEM kits to these schools for the students to practice with in preparation for the competition. Garver is an employee-owned multi-disciplined engineering, planning, architectural, and environmental services firm, headquartered in North Little Rock, Arkansas. With nearly 600 employees spread between 28 offices in 11 states.